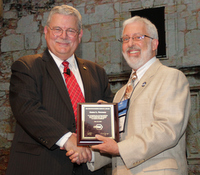 James L. “Jim” Newman received the Distinguished Service Award from ASHRAE (American Society of Heating, Refrigerating and Air-Conditioning Engineers) at the Annual Conference held recently in San Antonio, TX. Newman is owner and managing partner of Newman Consulting Group, LLC (NCG) in Bloomfield Hills, Mich. NCG is one of the Midwest’s premier energy efficiency and green building consulting firms, specializing in energy audits and LEED® (Leadership in Energy and Environmental Design) certification consulting. The Distinguished Service Award recognizes members for giving their time and talent on behalf of the Society. A Life Member, Newman is an ASHRAE-Certified Operations and Performance Management and Building Energy Assessment Professional, and also serves as an ASHRAE Distinguished Lecturer. He is a past member of the ASHRAE Detroit Chapter Board of Governors, and has served on various international technical and policy committees. Since 2002, he has been a certified trainer on ASHRAE/ANSI/IESNA Energy Standard 90.1, and has trained hundreds of architects, engineers and facility managers on the Standard. For a video of Mr. Newman's Award, click here. Newman also has served in various leadership and speaking roles for the US Green Building Council (USGBC), Detroit Regional Chapter and the Engineering Society of Detroit (ESD). He currently serves as Chair of the Sustainability Committee with the Building Owners and Managers Association (BOMA), Detroit Chapter, and also serves on BOMA International’s Energy and Environment Committee. Founded in 1894, ASHRAE is a building technology society with more than 50,000 members worldwide. The Society and its members focus on building systems, energy efficiency, indoor air quality, refrigeration and sustainability through research, standards writing, publishing and continuing education.